These organic lollipops are made only with natural ingredients and are bursting with delicious real fruit flavor. 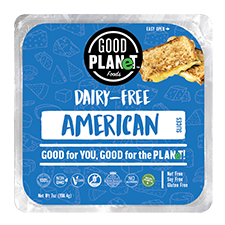 They’re free of many common food allergens and do not contain wheat, gluten, soy or nuts. Made with 100% natural colors and flavors. Kosher, Gluten-free & wheat free. Available in 2 sizes- 3 oz. bag (15 pops) is $2.49 and contains a mix of mango, pomegranate, blueberry and watermelon. 4.2 oz. bag (119g) contains 20+ pops and is $3.49. Contains a mix of pomegranate, peach, strawberry and cherry. From Janine of Hawthorne, New Jersey on 2/14/2011 . These are so delicious! Perfect for when you just need something sweet after a meal. Low in calories, no artificial sweeteners and really quenches the ol' sweet tooth. Some of the flavors are tart, so maybe wouldn't be the best for those who don't like sour candy. From Anonymous of Los Angeles, California on 1/23/2008 . 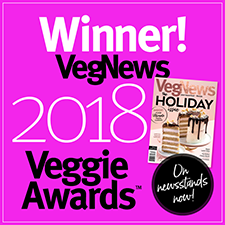 I'm a bad vegan who loves candy. I got some of these (if it's "healthier" I don't have to feel as guilty...), and all of the flavors are excellent. They taste like the actual fruits, they're tart, and not the syrupy kind of sweet like a cheap lollipop. They go a long way, and the pomegranate and lemon are almost like sour candy. From Natasha Shenk of Hailey, Idaho on 11/30/2007 . 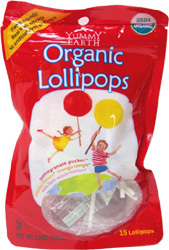 My kids love these organic lollipops. From Katie of orlando, Florida on 10/1/2007 . These are very extremely tasty and full of a powerful favor. However, they are pretty darn sweet.